The honey bee is native to the Old World. Humans have been interested in this insect, and its honey, since ancient times, and today, the honey industry has blossomed into a major economic concern. Honey bees also are of enormous economic value to humans through their role as pollinators. BeeSpotter visitors can browse the directory of BeeSpotter pages to find information on a number of topics specifically related to the honey bee. 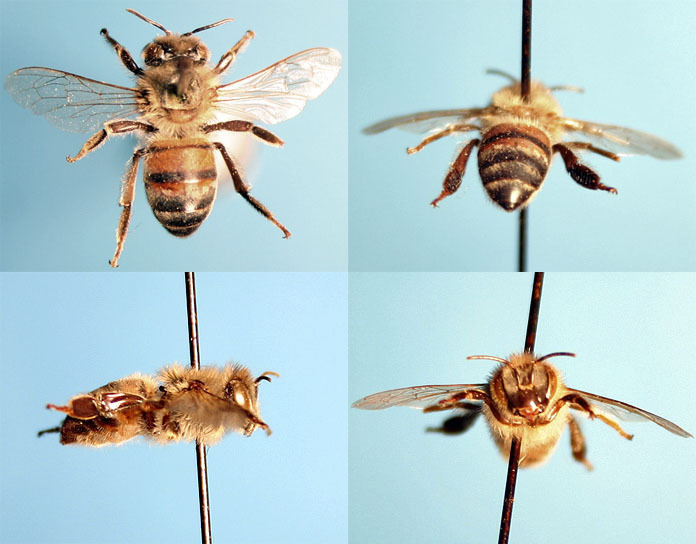 The honey bee is about one half inch long and rather stocky in body form. The head and thorax are dark brown, and they are densely covered with pale yellowish hair. The abdomen is hairy on the underside but is noticeably less hairy than the head and thorax on the upperside, which is brown with black banding (without any yellow in the cuticle), the hind part being almost entirely black with narrow transverse bands of pale hair at the intersections of the abdominal segments. Queens appear early in spring, as early as April 21 in Wisconsin (Medler and Carney 1963); colonies are relatively long-lived, lasting until late summer. Queens prefer willow, plum, and apple; workers, sweet clover and mint; males, horsemint, goldenrod, sweet clover, and aster.